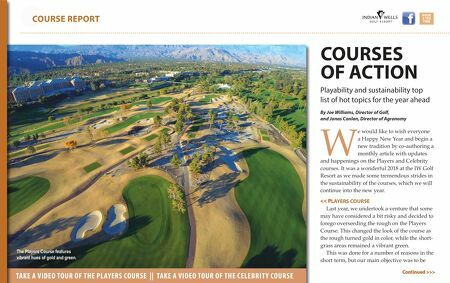 COURSE REPORT TA K E A V I D E O TO U R O F T H E P L AY E R S CO U R S E || TA K E A V I D E O TO U R O F T H E C E L E B R I T Y CO U R S E Continued >>> BOOK A TEE TIME COURSES OF ACTION Playability and sustainability top list of hot topics for the year ahead By Joe Williams, Director of Golf, and Jonas Conlan, Director of Agronomy W e would like to wish everyone a Happy New Year and begin a new tradition by co-authoring a monthly article with updates and happenings on the Players and Celebrity courses. It was a wonderful 2018 at the IW Golf Resort as we made some tremendous strides in the sustainability of the courses, which we will continue into the new year. << P LAYERS COURSE Last year, we undertook a venture that some may have considered a bit risky and decided to forego overseeding the rough on the Players Course. This changed the look of the course as the rough turned gold in color, while the short- grass areas remained a vibrant green. This was done for a number of reasons in the short term, but our main objective was to be The Players Course features vibrant hues of gold and green.